Muhammad Ali was born Cassius Marcellus Clay Jr. on January 17, 1942, in Louisville, Kentucky. 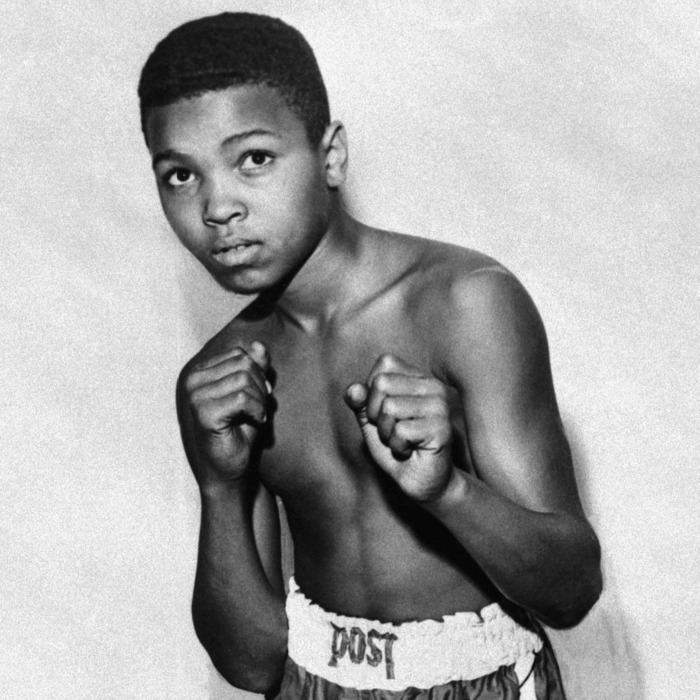 At an early age, Muhammad Ali showed that he wasn't afraid of any bout — inside or outside of the ring. Growing up in the segregated South, he experienced racial prejudice and discrimination firsthand. At the age of 12, Ali discovered his talent for boxing through an odd twist of fate. His bikewas stolen, and Ali told a police officer, Joe Martin, that he wanted to beat up the thief. "Well, you better learn how to fight before you start challenging people," Martin reportedly told him at the time. In addition to being a police officer, Martin also trained young boxers at a local gym. Ali started working with Martin to learn how to spar, and soon began his boxing career. In his first amateur bout in 1954, he won the fight by split decision. Ali went on to win the 1956 Golden Gloves tournament for novices in the light heavyweight class. Three years later, he won the National Golden Gloves Tournament of Champions, as well as the Amateur Athletic Union's national title for the light heavyweight division. Ali was married four times and had nine children, including two children he fathered outside of marriage. Ali married his first wife, Sonji Roi, in 1964; they divorced after one year when she refused to adopt the Nation of Islam dress and customs. Ali married his second wife, 17-year-old Belinda Boyd, in 1967. Boyd and Ali had four children together: Maryum, born in 1969; Jamillah and Liban, both born in 1970; and Muhammad Ali Jr.; born in 1972. Boyd and Ali divorced in 1976. At the same time Ali was married to Boyd, he traveled openly with Veronica Porche, who became his third wife in 1977. The pair had two daughters together, including Laila Ali, who followed in Ali’s footsteps by becoming a champion boxer. Porche and Ali divorced in 1986. Ali married his fourth and final wife Yolanda ("Lonnie") in 1986. The pair had known each other since Lonnie was just six and Ali was 21; their mothers were best friends and raised their families on the same street. Ali and Lonnie couple remained married until his death and had one son together, Asaad. In 1960, Ali won a spot on the U.S. Olympic boxing team, and traveled to Rome, Italy, to compete. At 6' 3", Ali was an imposing figure in the ring, but he also became known for his lightning speed and fancy footwork. After winning his first three bouts, Ali defeated Zbigniew Pietrzkowski from Poland to win the light heavyweight Olympic gold medal. After his Olympic victory, Ali was heralded as an American hero. He soon turned professional with the backing of the Louisville Sponsoring Group and continued overwhelming all opponents in the ring. Often referring to himself as "the greatest," Ali was not afraid to sing his own praises. He was known for boasting about his skills before a fight and for his colorful descriptions and phrases. 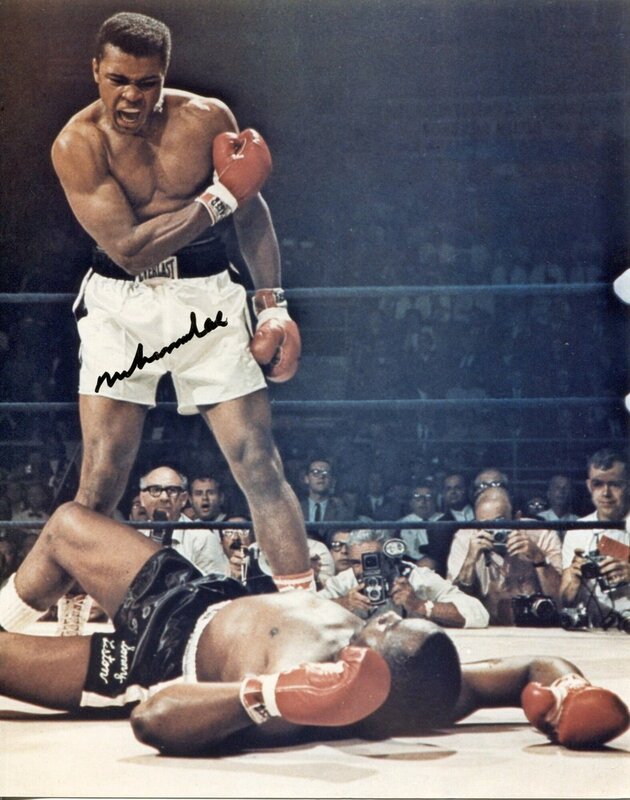 After winning gold at the 1960 Olympics, Ali took out British heavyweight champion Henry Cooper in 1963. He then knocked out Sommy Liston in 1964 to become the heavyweight champion of the world. In 1971, Muhammad Ali took on Joe Frazier in what has been called the "Fight of the Century." Frazier and Ali went toe-to-toe for 14 rounds before Frazier dropped Ali with a vicious left hook in the 15th. Ali recovered quickly, but the judges awarded the decision to Frazier, handing Ali his first professional loss after 31 wins. After suffering a loss to Ken Norton, Ali beat Frazier in a 1974 rematch. In 1975, Ali and Frazier locked horns again for their grudge match in Quezon City, Philippines. Dubbed the "Thrilla in Manila," the bout nearly went the distance, with both men delivering and absorbing tremendous punishment. However, Frazier's trainer threw in the towel after the 14th round, giving the hard-fought victory to Ali. Another legendary Ali fight took place in 1974 against undefeated heavyweight champion George Foreman. Billed as the "Rumble in the Jungle," the bout was organized by promoter Don King and held in Kinshasa, Zaire. For once, Ali was seen as the underdog to the younger, massive Foreman, but he silenced his critics with a masterful performance. He baited Foreman into throwing wild punches with his "rope-a-dope" technique, before stunning his opponent with an eighth-round knockout to reclaim the heavyweight title. After losing his title to Leon Spinks in February 1978, Muhammad Ali defeated him in a September 1978 rematch, becoming the first boxer to win the heavyweight championship three times. Following a brief retirement, Ali returned to the ring to face Larry Holmes in 1980, but was overmatched against the younger champion. Following one final loss in 1981, to Trevor Berbick, the boxing great retired from the sport at age 39. Muhammad Ali joined the black Muslim group the Nation of Islam in 1964. At first he called himself "Cassius X" before settling on the name Muhammad Ali. The boxer eventually converted to orthodox Islam during the 1970s. Muhammad Ali started a different kind of fight with his outspoken views against the Vietnam War. Drafted into the military in April 1967, he refused to serve on the grounds that he was a practicing Muslim minister with religious beliefs that prevented him from fighting. He was arrested for committing a felony and almost immediately stripped of his world title and boxing license. The U.S. Department of Justice pursued a legal case against Ali, denying his claim for conscientious objector status. He was found guilty of violating Selective Service laws and sentenced to five years in prison in June 1967, but remained free while appealing his conviction. Unable to compete professionally in the meantime, Ali missed more than three prime years of his athletic career. Ali returned to the ring in 1970 with a win over Jerry Quarry, and the U.S. Supreme Court eventually overturned the conviction in June 1971. Muhammad Ali passed away on June 3, 2016, in Phoenix, Arizona, after being hospitalized for what was reportedly a respiratory issue. The boxing legend had been suffering from Parkinson’s disease and had in recent years undergone surgery for spinal stenosis. In early 2015, the athlete battled pneumonia and was hospitalized for a severe urinary tract infection. 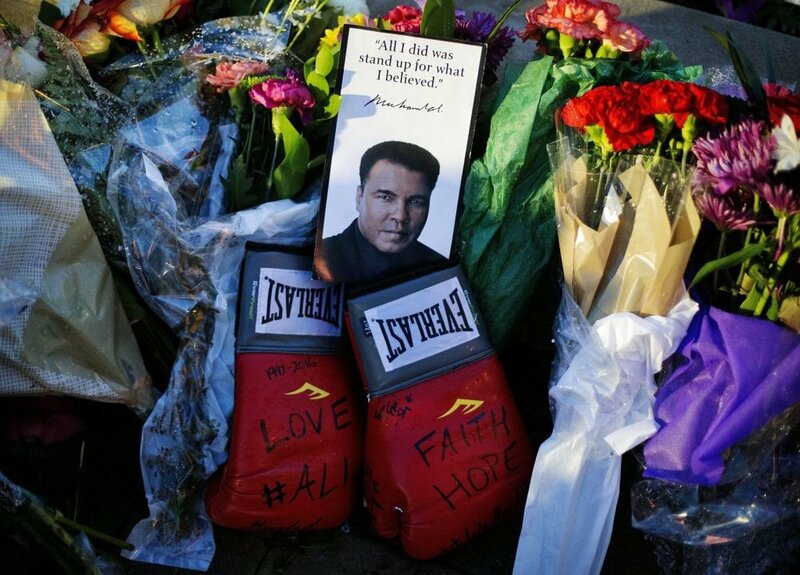 Years before his passing, Ali had planned his own memorial services, saying he wanted to be “inclusive of everyone, where we give as many people an opportunity that want to pay their respects to me,” according to a family spokesman. The three-day event, which took place in Ali’s hometown of Louisville, Kentucky, included an “I Am Ali” festival of public arts, entertainment and educational offerings sponsored by the city, an Islamic prayer program and a memorial service. Prior to the memorial service, a funeral procession traveled 20 miles through Louisville, past Ali’s childhood home, his high school, the first boxing gym where he trained and along Muhammad Ali Boulevard as tens of thousands of fans tossed flowers on his hearse and cheered his name.